A controversial decision faced the Warden and Society of Sutton Coldfield in the 1780s - “to whom of the neighbouring masters of hounds the privilege of drawing the park coverts should be conceded”. Some members of the Warden and Society favoured the Warwickshire hunt, some favoured Lord Donegal, master of the Staffordshire hunt. On one occasion some of the more influential members were absent, and Lord Donegal’s application was defeated by one vote - panic ensued, a new meeting was called, and Lord Donegal was voted in. 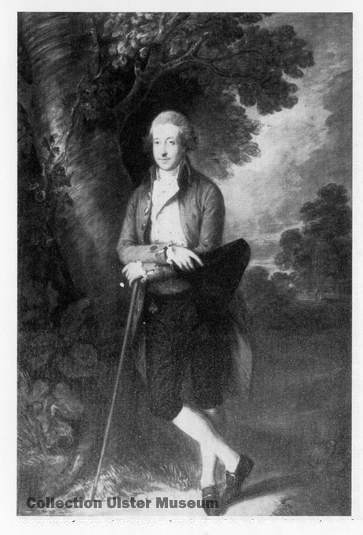 Arthur Chichester became the fifth Earl of Donegall (with two Ls) in 1757 at the age of eighteen; his inheritance included over 250,000 acres of land in Ireland, including the town of Belfast. He purchased the Fisherwick estate, a few miles north of Tamworth, where he employed Lancelot Brown to landscape the park and build a magnificent stately home, which was completed in 1774. He was a keen farmer at Fisherwick where he kept over fifty horses including racehorses and hunters. He was created Baron Fishewick in 1790 and Marquess of Donegall in 1791 - not a man to be snubbed by Sutton Corporation, or to be refused permission to make a gallop or ride in Sutton Park where the hunters came in near the Parson and Clerk Inn. Lord Donegall died in 1799, Fisherwick was sold, and the hall was demolished in 1814. A new hunt had been formed in Staffordshire in 1793 by the Vernons of Sudbury Hall, and in 1798 the Warden and Society gave equal leave to Lord Vernon and Mr. Adderley of Hams Hall, Warwickshire, to hunt the woods of Sutton Park. The South Staffordshire Hunt continued to meet in Sutton Park into the twentieth century; in 1970 the South Staffordshire united with the Meynell Hunt which began life as the Vernon hunt. The foxes of Sutton Park are no longer hunted with hounds, high-fed hunters no longer thunder along Lord Donegal’s Ride at full gallop, but there was a time when the woods echoed to the sound of the huntsman’s horn. Arthur Chichester, 5th Earl and first Marquess of Donegall (1739-99), painted by Thomas Gainsborough c.1780.